Let’s be real for a second. 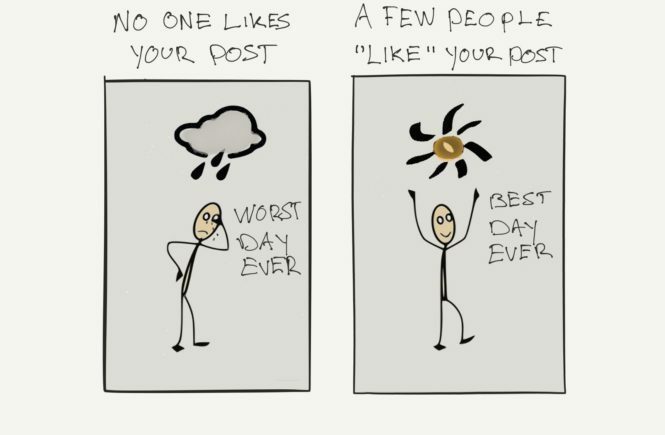 How often does your mood and confidence depend on the number of likes you get on Facebook, Twitter, or any other place that has social currency? Sadly, many of us trade social currency for confidence. Sounds like a pretty good deal, right? I’ll like your dog pictures on Facebook. And you like my cool new profile picture with sunglasses while I’m looking away from the camera. There’s one downside this exchange. It’s fleeting - and makes us more reliant on external validation than ourselves. It’s what I call crowdsourcing confidence. But, what happens when no one likes the stuff we share? We feel like crap. It’s not only on social media. A lot of people don’t have social media profiles at all. Instead, they trade compliments from their spouse, boss, friends, colleagues, for confidence. It’s validation. We depend on it. For years, I’ve chased validation without even knowing it. It just creeps in your system. For more tips to help boost your confidence, sign up for Shine. As an entrepreneur, I worked hard to get validation from clients or prospects. If people didn’t like our products, I doubted myself. But when a client gave me a compliment the next day, I thought I was doing well. And when I worked for a major corporation, it was the same. When my colleagues or boss acknowledged my work, I was happy with my job. And when people didn’t acknowledge my effort, it was the worst job in the world. It’s also true for relationships. That type of behavior damages relationships, and more importantly: Yourself. “But why should I do anything? Do things for yourself. Not in a selfish way. You’re here for a limited time so you might as well enjoy it. And stop worrying about what other people think about you. Don’t rely on outside sources like compliments or attention. Have you heard of Mirror Neurons? In the 80s, neuroscientists in Italy found that primates have neurons in their brain that are responsible for imitative behavior. In simple words: We copy each other’s behavior. That’s how I also learned to stop searching for validation. From my mentors. Confidence starts with a belief. It’s something you can create instantly within yourself. Instead of believing that you can’t you start believing that you can. Next, your body follows. Instead of sitting hunched, with your shoulders pointing towards the ground, you straighten up, open up your chest, and breathe through your nose. Think it. Feel it. Do it. Believe it. I have several mentors, and they all work hard for themselves. But at the same time, they also provide value for other people. Because they don’t worry about what other people think of them, they can spend their time on their own business. And the best thing about stopping to crowdsource your confidence is that you can focus on what matters. At the end of the day, you’re not defined by how many likes, compliments, or pats on the back you receive. Actions are the only tangible thing we have in this world. It’s not our word that counts. And if you feel strength in your own abilities, you will ultimately become more confident. You have more capabilities than you think. You just have to look inside yourself, not outside.